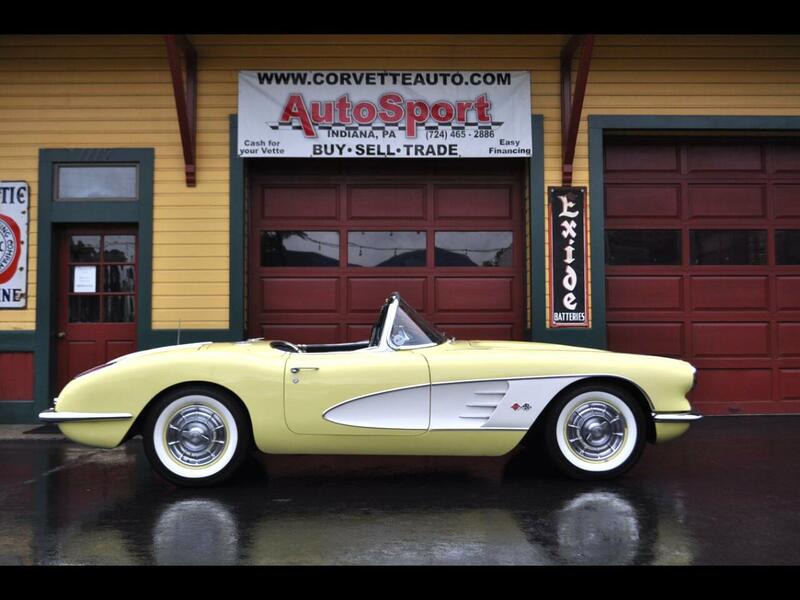 Used 1958 Chevrolet Corvette Extemely Rare Panama Yellow 1958 Corvette! for Sale in Indiana PA 15701 AutoSport Co. Trim: Extemely Rare Panama Yellow 1958 Corvette! For Sale is an extremely rare Panama Yellow/Charcoal interior Corvette Convertible! This car has been documented by its previous owner with a log he kept up to date. He documented every mile he put on the car including where he went and services! There are some various receipts that will be included with the car. The Panama Yellow Paint is factory correct and doing a thorough check on this car it appears to have been born a Panama Yellow Car from the factory. The paint is in good condition and shows well. The body is in excellent condition, the fiberglass body panels appear to be original and this car has a nice clean fit and finish. The interior is in good order and is factory correct with its factory color option, Charcoal. The original gauges, clock, gear shifter, and Wonderbar Radio is in place. The seats are in good condition. All the Chrome on this Corvette is in good condition and shows great on this Corvette. The 1958 Corvette is unique with it's washboard hood and chrome trunk spears, and if you love chrome the 1958 Corvette offered the most chrome you can have on corvette from the factory. Under the hood is a 327ci V8 engine dressed with a correct air cleaner and Aluminum finned valve covers. The frame is a solid clean rust free frame in excellent condition. The trunk is complete with the mat, trunk board, and trunk liner w/ jack tools and a spare. The car is mechanically sound. The convertible soft top is in good condition. The overall condition of the car is great for car cruises and shows. There is nothing comparable to a Panama Yellow Corvette! This is and extremely rare find and highly coveted Corvette. Please feel free to call us at 814-977-9219 or email us with any question! Message: Thought you might be interested in this 1958 Chevrolet Corvette.